WASHINGTON, April 20, 1989 – Charles G. Holle, a retired Army Major General who was former Deputy Chief of the Army Corps of Engineers, died of pneumonia and complications of a stroke Monday at Walter Reed Army Medical Center in Washington. He was 90 years old and lived in Washington. 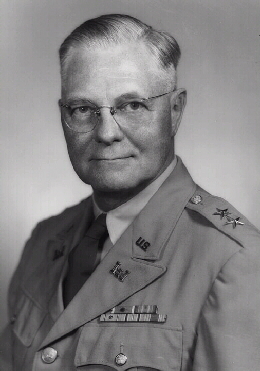 General Holle was a 1920 graduated of the United States Military Academy at West Point and served as Deputy Chief of Engineers from 1954 until his retirement in 1958. Previously he had been Chief o Construction on the St. Lawrence Seaway Project, United States Commissioner on the Permanent International Association of Navigation Congresses, Chairman of the Board of Engineers for Rivers and Harbors and presidents of the United States Beach Erosion Board. He was a member of several professional engineering societies. He is survived by his wife, Anne, and two sons, Kendrick, a retired Lieutenant Colonel, and Branford, a retired Major, both of Arlington. 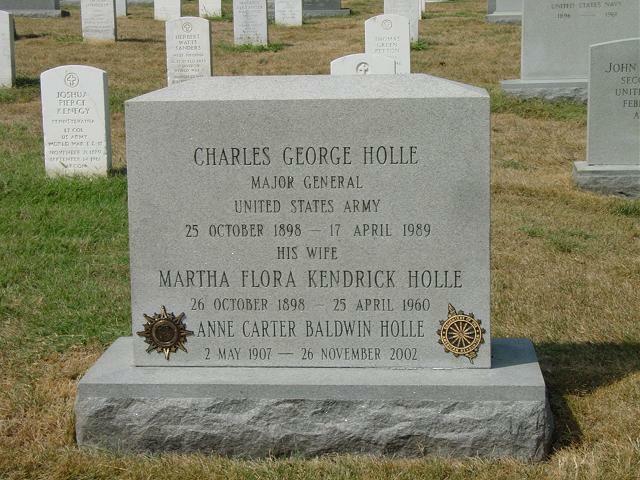 On November 26, 2002, Anne C. B. Holle of Washington, D.C. Beloved wife of the late Major General Charles G. Holle (Retired); loving step-mother of twins Lieutenant Colonel Kendrick Holle (Retired) and Major Bradford Holle (Retired) both of Arlington, Virginia. Mrs. Holle was a member of the Order of Eastern Star in Arlington, a member of the DAR and many other lineage societies as well. Funeral services will be held on Tuesday, December 17, 2002, at 3 p.m. at the Old Post Chapel at Fort Myer, where internment will immediately follow at Arlington National Cemetery. Expressions of sympathy in her memory may be made to a charity of the donor's choice.